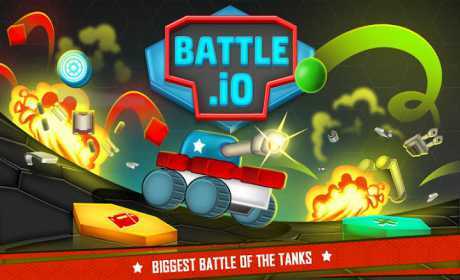 Battle.io is the latest tank io game in a hexa battleground for you to enjoy! Control your tank to move around by virtual control lever when your finger touches the screen. Allow continuous emission of multiple cannonballs. With missiles flying, explosion and fires! Use the joypad to move your tank around and attack the enemy tanks. The goal of this game is to defeat all of your competitors on the map and fight to the last one. This io game has multiple retry options so you can keep playing endlessly. Then you’ll survive and win! Move over the dots to collect the bullets that eject out of your canon. Make sure that your bullets never go empty. 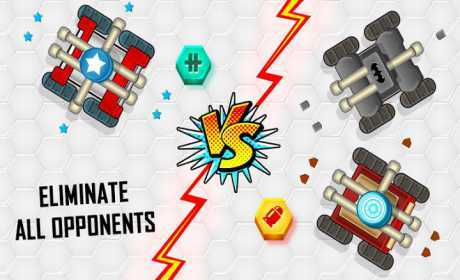 Your tank starts with one canon, collect special cannon powerups to increase the firepower upto 6x canons for multiple impact from all directions! Destroy your opponent to maximise your score and then take over their health points to make your health the highest! The longer you survive on the hexa battleground, the higher your health and your points go. 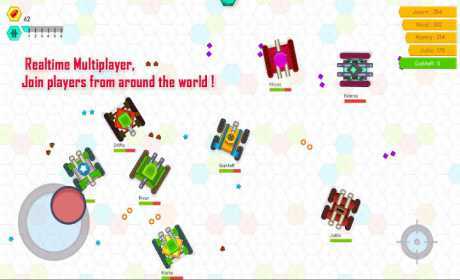 Explore various hexa themed worlds to get the best feel of this battle game. Bored of your own tank? Do not worry, we have 15 super cool upgrades for you to change to! So get ready for the mega battles of the tanks ! – Cool skins and tanks for your choice.